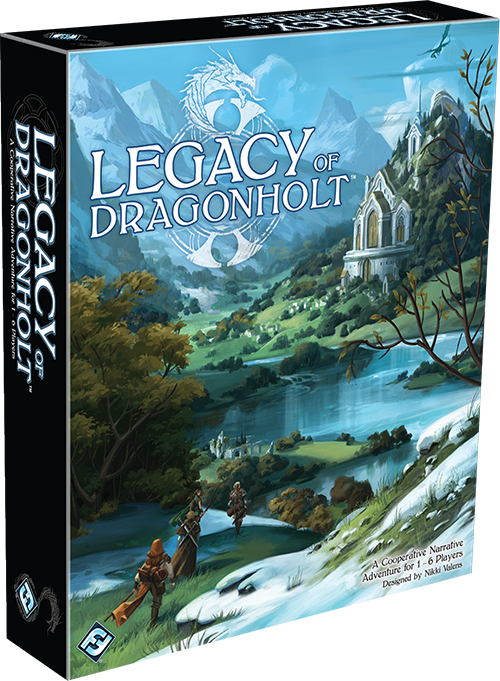 What is Legacy of Dragonholt? Fantasy Flight Games is a super busy company. With all their Cthulhu games, Star Wars products, DOOM, Fallout: The Board Game, and Legend of the Five Rings, it is easy to overlook the strong push for their Runebound universe. They released a 3rd edition of Runebound, Runewars Miniatures launched, Battlelore, and Descent with its GM app. But now they have something new. Legacy of Dragonholt is on its way this year. What is Legacy of Dragonholt? Well that is a good question. At first I was thinking it was a “starter set” to a new RPG system but they mention there is no GM and it comes with six quests to go on with friends. But there is character creation and it is about the story and what happens. That sounds like a role playing game to me. Best guess, it is a new/different take on T.I.M.E. Stories. Except maybe a more connected storyline. Though TS is an Asmodee product, at least this seems pretty self-contained. Narrative games have become a hot commodity recently but with Runebound 3rd Edition having stories in it, I feel like this will compete with that. I was just looking at whether I wanted to get R3E but after this reveal, my interest finds itself here. There is a lot unknown about this recently announced game but GenCon is next week so I assume more will come out. But you may color me interested.